Indian Ambassador to Indonesia, H.E. Mr. Pradeep Kumar Rawat, and Head of the Agency for Policy Analysis and Development (BPPK) of the Ministry of Foreign Affairs of the Republic of Indonesia, Dr. Siswo Pramono LLM, gave a public lecture in front of Unsyiah academic community. 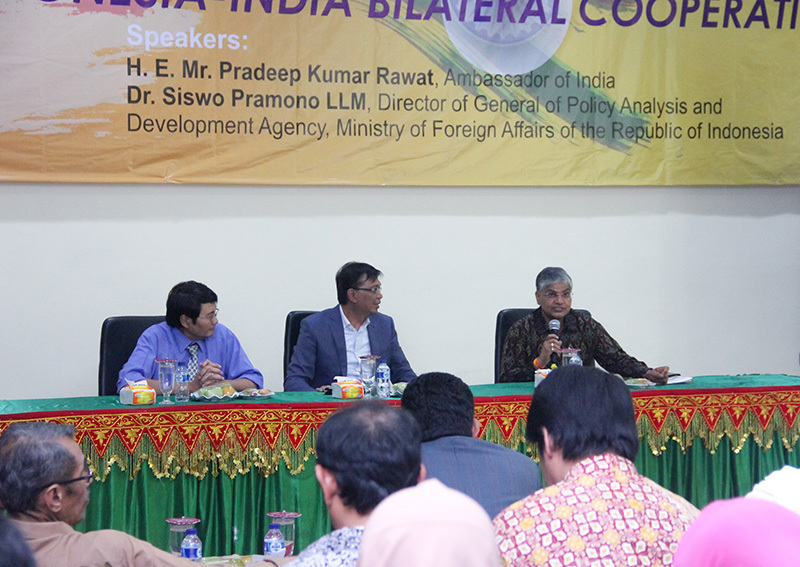 The guest lecture themed "Strengthening of Bilateral Cooperation between Indonesia and India" was held at AAC Dayan Dawood Unsyiah Building, Wednesday (7/11). In his speech, Rector Unsyiah, Prof. Dr. Ir. Samsul Rizal, M. Eng., Said that Indonesia's relationship, especially Aceh, with India is very strong. Unsyiah itself has worked with several campuses in India, especially in the academic field. The Rector expects this cooperation to be broader and covers many other fields, such as Education, Research, and other fields. "We hope Unsyiah students can learn from India related science of IT, medicine, and other science sciences. Because India mastered the discipline, "said Rector. The same thing is also said Pradeep Kumar who said India and Indonesia have been cooperating for a long time. This is evidenced by the dependence of exports and imports between the two countries is very large. Especially now, development in tourism, education, and technology between the two countries is being promoted. Meanwhile, in this guest lecture, Siswo Pramono expressed the priority of cooperation between the two countries. He mentioned if Indonesia has 15 partnership strategies in various worlds, and India is the important one. "The relationship between Indonesia and India is very strong and complete. In terms of both air, land, and sea defense, all three have close ties to India. "